Since having depression, and starting my blog i have always wanted to write a post or 2 on the subject, but always thought that it was a little to personal for the internet, but then i think that what don't i put on here really? 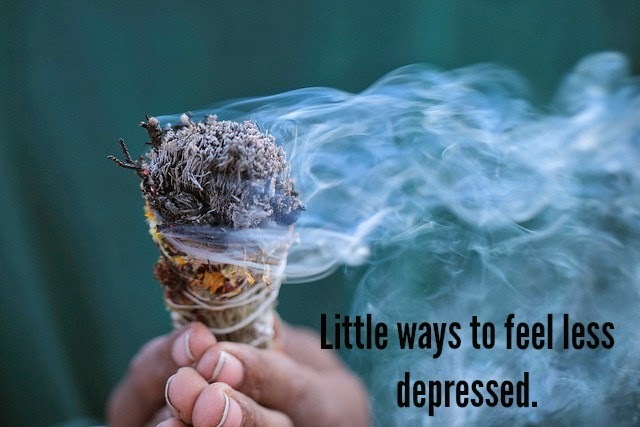 So i have put a few different tips together to help you feel less depressed. 1. Get in a routine - Depression can change the structure of your life, one day can fall into the next, starting off small with a gentle routine can help you get back on track. 2. To do lists - Setting daily goals can help you accomplish every day stuff even when you feel like you can accomplish anything. Start small simple things like walking the dog every day or doing the dishes, or even making our bed. 3. Working out/ Eating healthy - exercise can and will help you to feel a lot better. It temporarily boosts endorphin's, this can have a long term effect on anyone struggling with depression. Also if depression tends to make you comfort eat then starting to eat healthy will also help you feel a heck of a lot better because junk food will not make you feel any better! 4. Sleep - Sometimes depression can make it hard for you to get sleep, i know i struggle with that i lot. Not enough sleep can make depression worse too. You can try to change this my setting a bed time (yes i know it sounds silly) but going to bed, and getting up at the same time everyday should help. Also try to take any distractions out of your room, in time you might find that this helps. 5. Try to have fun - Make time for things you enjoy. For me i struggle with this because nothing seems like fun, but pushing yourself to do things you used to love can only make you feel better, even if they do feel like a chore at the time, keep going to the cinema, meeting friends and going shopping. you basically have to relearn how to have fun, in time, things will be fun again. I've already started on this list, and for sure i am trying to do things i used to love like go to the cinema..